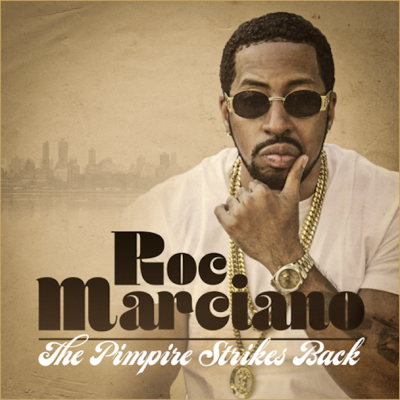 Roc Marciano has given us two new releases this holiday season: the free mixtape The Pimpire Strikes Back and album Marci Beaucoup. Put both on your gift lists – buy one for your kids, download the other for your grandmother. Or the other way around. However you want to do it. But support this guy. Roc Marciano is as good as it gets in hip hop right now. And if that sounds like a backhanded compliment in the current culture full of conspicuous consumption, unabashed conventional capitalism, and white guy metrosexual artistes, it’s not. Roc is the real deal. He has the hypnotic delivery of Rakim and the rhyme virtuosity of Kool G Rap with an intelligent pimp persona, who would seem to prefer to stay behind the curtain counting his money while the other fools dance away their dignity or Twitter beef into obscurity. His production is off-kilter soulful funk – think classic Pete Rock, RZA, and Madlib (who contributes a track to the mixtape). He’s already been kind enough to give us two classic albums, 2010’s Marcberg, which sounded like a worthy heir to “…Only Built For Cuban Linx” in its cohesive sound and story, and 2012’s woozier Reloaded, which was defiantly more obtuse with a structure that was less immediate but just as rewarding. Not to mention the rest of the catalog, including his stellar work with The UN, an EP with The Alchemist, and guest work with Action Bronson, Ka, and Mayham Lauren. There’s a lot of great music coming from these guys – this is a movement that is worth watching, following, and supporting right now. The strange thing about these two releases is that the mixtape is far better than the actual album, which itself feels more like a compilation than a proper followup to his first two solo releases. The free The Pimpire Strikes Back isn’t arranged like a traditional mixtape with crossfades and a DJ and all the other conceits that started sounding stale somewhere around 2004. It opens with the same old pimp film dialogue as the first albums, the sort that includes little gems of wisdom that resonate even more deeply in this context. Roc’s own production alternates with guests like Madlib, Alchemist, Evidence, and Lord Finesse – worthy company who all bring their best stuff to the party. But the mixtape isn’t really about the guests or the individual tracks – it’s about the full cohesive album of the sort that’s rarely achieved now in the age of soundcloud and spotify and iphone and all the other soulless vehicles that are crushing the life from the music business. The Pimpire Strikes Back has that trademark sound, Roc’s sound, and it works as the next chapter in the discography. The guest production fits right in: Lord Finesse’s “Bruh Man” in particular has the lo-fi Marcberg style down just right. Roc’s own beats are as funky, haunting, and subtly complex as always. The flow is rich as ever: “like Watergate skipped the court date just to fornicate/warpaint face/your mixtape’s done in poor taste/I’m watchin horses race”… “words from the good bishop/I’m an outcast I don’t fit in the system/my outfit furry like a house pet”…and so on. Some new styles as well: there’s what sounds like a Max B style to the sung chorus of “Ice Cream Man” – and that would be a collaboration that probably would have already happened if not for the ignominies of Max’s case. Marci Beaucoup is a different sort of project: the first voice is actually Evidence’s, which sets the tone for the guest heavy style of the album. Every track is a collaboration of some sort, and the overall tone is similar to one of those Wu-Tang affiliated albums like Legendary Weapons – not quite as strong or cohesive as a main catalog album, but still maintaining that familiar sound and some standout songs and verses. Some of the guests are surprising: we have SAS appearing on “Willie Manchester” and forgive me if the last I remember from them is their Dipset work from the mid-2000’s but that shoutalong British flow works on the piano loop beat; Cormega is back after an appearance on the mixtape as well, adding his fervent energy and sharp poetic turns that always work better in guest shots than on his own full albums; Ka appears twice with his unique low-key but high density lyricism, affecting as always good chemistry with Roc – the collaboration project between the two of them will be a sure highlight in 2014. Unfortunately, not all the guest spots work: Action Bronson sounds weary on “456,” as if someone dragged him from the couch and the bong against his will – I like Bronsolino a lot and he’s always great with Roc but this track sounds like a mixtape throwaway, not an album feature; and the less said about Freeway’s appearance the better, but his verse is the sore thumb or perhaps the scraggly beard on this album. 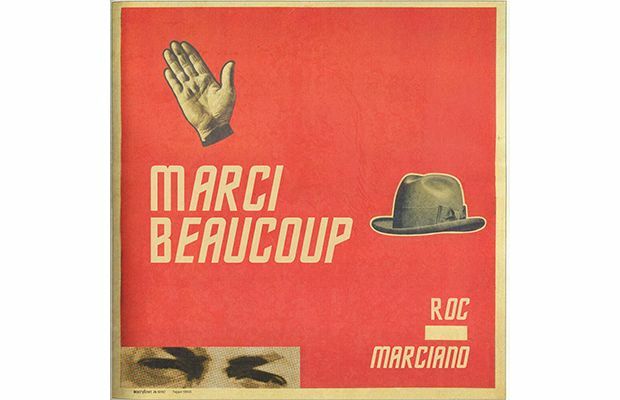 The beats are also not as distinctive on Marci Beaucoup as on the mixtape or any of Roc’s previous work. Which is odd, because this is ostensibly more of a production and guest rapper showcase album for him. Beats like “Squeeze” or “456” are just vocal loops, and particularly creative ones either; they sound more like Sunz of Man album tracks than the sort of layered, subtle sounds Roc usually puts together. Listen back to “Thug’s Prayer Part II” from Reloaded, the way the beat flails around before settling into that familiar groove – it’s an odd, distinctive sort of production technique that I expected more of on this album. It’s still a great sound – I’d always rather hear these sort of dusty soulful beats than electro club trash, but the overall quality is just a bit lower than previous efforts.